It’s easy to pick up Fable Fortune, the real key is mastering the cards! Here’s some handy tips straight from the Guildmaster himself, they might just prove useful next time you’re staring down the angry end of a chicken! Though Fortune is built on the core stats of Strength, Health and Gold Cost, it’s card abilities and how they’re used which will generally define how the game goes. Not every unit will have an ability, but the ones that do can have effects as varied and powerful as spell cards. Keep in mind though, whether it’s a spell or a unit, no card exists in isolation and you’ll find many cards which can go together to create powerful synergies. 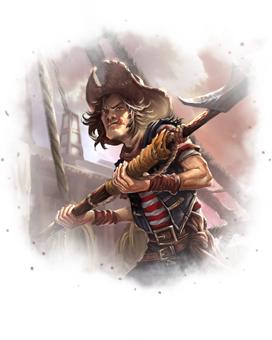 Though some decks will serve as a Jack of all Blades, if you really want to maximise the potential of your cards you’ll want to consider building your deck around a core concept or element. This core could be a single card, a Hero Power of a specific morality or even a Quest. For example you could build a Hobbe deck with a strong focus on spells; not only would it be tailored towards quickly finishing the ‘Play 2 spells’ Quest, but the Hobbe Ambusher reward I would receive would have synergies with the rest of my deck. Your core resource is your cards, specifically the ones in your hand. The more cards you have in your hand at the start of any given turn, the more potential choices you have when responding to your opponent's moves. Try not to exhaust your hand completely if you can, and perhaps even think of including cards that let you draw more from your deck. Though it may be tempting to use your spells and abilities to create a huge, terrifying unit, you might want to think twice about doing so. You never know what removal spells or deadly combos your opponent might have up their sleeve. That 20/20 Chicken Vengeant might look impressive now, but it could just take one clever move from your opponent to reduce it to a pile of really muscular feathers. Often you will be faced with a variety of possible choices in any given situation, when this arises it's important to think about which choice gives you the best ‘value’, in other words how can you achieve your goal using the least possible resources. For example, if you have to use three cards to deal with one card you’re potentially losing more than you’re gaining. The Guard button is one of your greatest tools in defining the tempo of the game. Used correctly you can potentially keep units alive to pull off a planned combo, force the opponent to lose a valuable unit by attacking or just protect your precious face from a dreadful pummeling. You won’t always necessarily want/need to Guard but it’s important to take it into consideration as, due to it costing 1 Gold to use, you will need to factor it into your plan for how you’ll spend that turn’s Gold. Don’t forget to do your Quests, it’s what being a Hero is about after all. Not only will completing a Quest reward you with a card, it will also allow your Hero to increase their Good or Evil points, giving them access to a more powerful Hero power as well as some mighty morality cards. Some decks may not care much about having a wall of big beefy units; nonetheless it's important to keep in mind how many units the player has on the board in relation to yours. A deck devoted to big units will find it difficult to build up steam if the enemy already has an army ready to respond to it, and a more aggressive deck can break in the face of against a strong Guard. Don’t let your opponent get too far ahead unless you have a way to level the playing field! Fable Fortunes Co-Op bosses all have unique themes and playstyles and if you want to beat them, especially at higher difficulties, you should build a deck specifically for countering that boss. Here’s a free insider tip for Nostro; his Living Death Hero Power will resurrect one of your units and place it on his side of the board, however as it is summoning them instead of playing them, it will not trigger their Big Entrance abilities thus he cannot use your own card abilities against you if you fill your deck with Big Entrance units. Though you may not always have the benefit of being able to talk directly to your ally, Fable Fortune’s suggestion feature will allow you to bring attention to something on the board or suggest specific moves on the bosses/your ally’s turn. For example, I could ping a unit card in my ally’s hand to suggest they play it, then draw a trail from the Guard button to that unit on the board to propose that they put it in Guard. It is important not only to consider your own deck when making choices in Co-Op, but your a too. You may not have an exact idea of what cards your ally has, but their Hero choice alone can be used to inform your decisions. For example if my ally is playing as the Shapeshifter, you might choose to ignore a big unit the boss has on the board in favour of attacking them directly with the knowledge that your ally probably has a way of easily removing the unit on their next turn.